Picture it, it’s nearing October and the Red Sox and Yankees are meeting at Fenway for a final showdown. The pennant is potentially on the line (or at least a playoff appearance). Tensions are high. Mariano Rivera is on the mound. David Ortiz is at the plate. Tie game. Bottom of the 9th. Bases loaded. Full count. Two outs. Rivera just got off the disabled list and his shoulder may be troubled. Ortiz has had his number all season but he’s been slumping lately too; fatigued from the season and a lingering wrist injury. One pitch will set the teams fates. Win or lose. Here it comes. Now adjust your screen. The same scenario is actually playing out in a video game on your PS3 or Xbox 360. The video game is mirroring reality. You’re playing a friend for bragging rights and beer. Same playoff race. Same scenario, right down to the injuries and fatigue. To some the idea sounds farfetched but it isn’t, it’s a concept called “Dynamic Gaming” and it’s actually a reality in some games today. Electronic Arts first roled out a commercial demonstration last year. Through a partnership with The Weather Channel that slipped largely under the radar of most major media (the Metue profile is here), EA enabled it’s NCAA Football title to change the weather at the game’s virtual stadiums to match the real world. As described in the press release at the time: "Every time a player with a live Internet connection loads a new game, they have the option to choose real-time weather from TWCI. The video game will then use the current conditions at the selected location to create the weather experience for that game." Comparing Dynamic DNA to the weather experiment is like comparing a ’57 Corvette to a Ford Model-T. The data is drawn from the same statistical database used by NBA coaches. With it Dynamic DNA can adjust to a player’s hot (or cold) streaks throughout the season. If Shaq becomes a free-throw genius midway through, the game (if Dynamic DNA is turned on) can adjust. It can track player and team performances. Offense and defense. Video game players can even use a “rewind” feature to adjust their game (and player performances) to a recreate a historical matchup from earlier in the season. In today’s world, most console games take millions of dollars and several years to develop. In addition to general development, they carry costs for outsourced art, voice licensing and game engines. They also carry massive marketing expense. When it comes time for sales, a title has a limited shelf life, maybe a few years. During that time, the developers need to recoup the millions of expense. It’s an equation (high cost, short life), similar to the movie industry, that creates financial imperatives for supporting “tent poles” – the sure thing sequels. It’s an environment where studios consistently redeploy known brands because they’re the only commodity that can provide relative insurance of a secure income. Creativity and innovation are sacrificial. 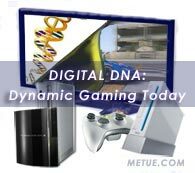 Dynamic gaming is a business innovation with the potential to improve the situation (assuming its jointly embraced by publishers and audiences, and the offerings provide an improved user experience). It’s a matter or previously unavailable recurring revenue. In a dynamic gaming world, titles can be expanded and improved through subscriptions services. A Madden 2009 could in the future become simply “Madden,” a single SKU title upgraded on-demand or by user subscriptions. With extendable content, a title’s shelf life (or earnings period) can be spread across a longer period of time. Fee-based dynamic gaming elongates the tail and brings money to offset publishers short term risks. It’s not a cure all, but it’s a potentially significant reinvention of the business models underlying console game sales. That makes it something to watch. Shortly after we published this article, EA issued a press release announcing their FIFA ‘09 title will also feature dynamic updates (release). It was also mentioned on Peter Moore’s blog. (Peter is President of EA Sports). EA is calling the feature the “Adidas Live Service” and appears to be positioning it for just the kind of subscription service we were projecting above. A global network of scouts will monitor every player in the adidas Live Season leagues throughout the season to supply accurate and in-depth player and team data each week. Player attributes will be impacted and player performance will change dynamically. The adidas Live Season service is downloaded into FIFA Soccer 09 each week and will run from the launch of the game to the end of the 2008-2009 season. Gamers will have access to one league of their choice for a free trial from the moment they activate it to the end of the 2008-2009 season. The new service will be available for Barclay’s Premier League, La Liga BBVA, Ligue 1, Bundesliga, Serie A and Mexican Primera Division on the PLAYSTATION®3 c, Xbox 360® and the PC. Q: What is adidas Live Season? adidas Live Season is a premium service for FIFA 09 PS3, Xbox 360 and PC that will update in-game player form each and every week. The service will run from the launch of the game to the end of the 08/09 season and is based on how real players performed in the most recent real-world matches. FIFA 09 will feel different every week throughout the entire season matching the weekly rhythm of football. Q: Is Live Season similar to Dynamic DNA? While the concept is essentially the same, the execution of both features is very different. Please see NBA Live 09 literature for more information on Dynamic DNA. Q: Why aren’t all leagues of FIFA 09 included? This is the first year of the service and a completely unique feature that has never been attempted before for football videogames. As a result, we made a decision to provide the best service by limiting the service to the six leagues that have the biggest global reach that match the same lifecycle of FIFA 09. This enables us to provide the best possible service, and effectively anticipate and manage any unknown variables that might appear with a new online service of this scope and size. Q: How much will your charge for the Live Season service? We’ll be announcing the costs nearer to the launch of FIFA 09 this fall. However, we are going to be giving everyone who buys FIFA 09 on PS3, Xbox 360 and PC a free trial of one league of their choice from the moment they activate it to the end of the 08/09 season. Q: Who decides on how the stats are changed? We have a global network of football experts who work with us every year to make sure the FIFA franchise includes the most accurate player and team data. This same team of passionate experts monitor every player in the Live Season leagues to supply in-depth data each week. Q: What happens to seriously injured or suspended players? When players are seriously injured, they may get a poor or bad form rating to reflect the fact they aren’t able to play up to their rating in the database. We are not making players unavailable due to suspension or injury for the service this year. Q: Can I turn the service off if I don’t want to play with the weekly data? Gamers are free to turn off the service whenever they want: online or offline. Q: Can I simply reset the service and get back to the stats from the start of the season? Yes, you can reset your squads back to the same way when you first played the game. You can decide whether you want to play with the latest form, or with the default player database: offline and online. It’s your choice each time you play. Q: Can I play against a player that doesn’t subscribe to this service? In online matches, a gamer with Live Season can play against a gamer who doesn’t have Live Season but only the subscriber will be able to use the data for his team. Q: How long will that service last? Live Season is a premium service that will run from game launch until the end of the 08/09 seasons. Q: Why is adidas the sponsor and what where the costs involved for adidas? When we originally conceived the idea of Live Season we knew that we were taking football authenticity in video games to the next level. We wanted to partner with a company who matched our own ambitions within the sport and who are also on the cutting edge of development of football products. adidas are a truly global company and the foremost football brand for apparel and equipment. EA SPORTS&trade; is the leading football videogame brand delivering an interactive experience that enables gamers around the world to live out their dreams virtually and play with their favorite teams and players. The association offers both companies the opportunity to leverage a mutual passion for football and the desire to bring new, unique experiences to the consumer. We are unable to disclose the details of the agreement between adidas and EA. •EA & Take Two: Now They’re Talking. • Futurism: Gaming Gesture Controls The Next Generation?